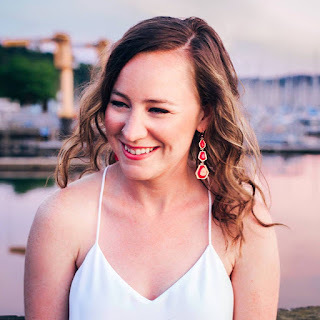 Love Made Visible Blog: What's for Lunch? Nate and I both pack our lunches in the evenings so that we don't have to buy lunch at work every day. I have been loving my big quart sized mason jars recently for bringing juice to work. But the other day, I read a post all about packing the perfect salad in a jar, using the same big mason jars! Yes, that's right, leafy green salads. Dressing goes on the bottom, veggies and other salad goodies get piled on top. Everything stays separate and dressing-free until you toss the salad together in the bowl. Even better, these salads last for days in the fridge so we can make a week's worth of lunches ahead of time. The salads look so yummy and fresh, I've been just dying to try. Here is a good How-To excerpt from the article: "How do the greens not get soggy? 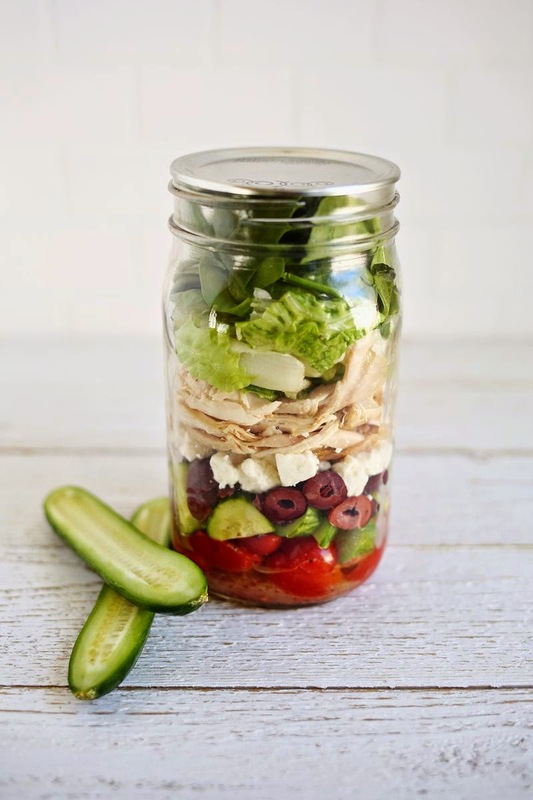 The basic idea when packing salads in jars is to start with the heaviest and most non-absorbent ingredients with the dressing on the bottom of the jar and work your way up through the lighter ingredients until you end up with the salad greens themselves. As long as your jar doesn't accidentally tip over you in your bag, the delicate greens will be well-protected from the dressing until you're ready to eat." Salad Dressing: Pour 1 to 4 tablespoons of your favorite salad dressing in the bottom of the jar. Adjust the amount of dressing depending on the size of the salad you are making and your personal preference. Hard Vegetables: Next, add any hard chopped vegetables you're including in your salad, like carrots, cucumbers, red and green peppers. Beans, Grains, and Pasta: Next, add any beans, grains, and/or pasta, like black beans, cooked rice, and pasta corkscrews. Cheese and Proteins (optional): If you'll be eating the salad within the day, add a layer of diced or crumbled cheese and proteins like tunafish, diced (cooked) chicken, hardboiled eggs, or cubed tofu. If you're making salads ahead to eat throughout the week, wait to add these ingredients until the day you're planning to eat the salad and add them on top of the jar. Softer Vegetables and Fruits (optional): Next, add any soft vegetables or fruits, like avocados, tomatoes. If you're making salads ahead to eat throughout the week, wait to add these ingredients until the day you're planning to eat the salad and add them to the top of the jar. Salad Greens: Last but not least, fill the rest of the jar with salad greens. Use your hands to tear them into bite-sized pieces. It's fine to pack them into the jar fairly compactly. 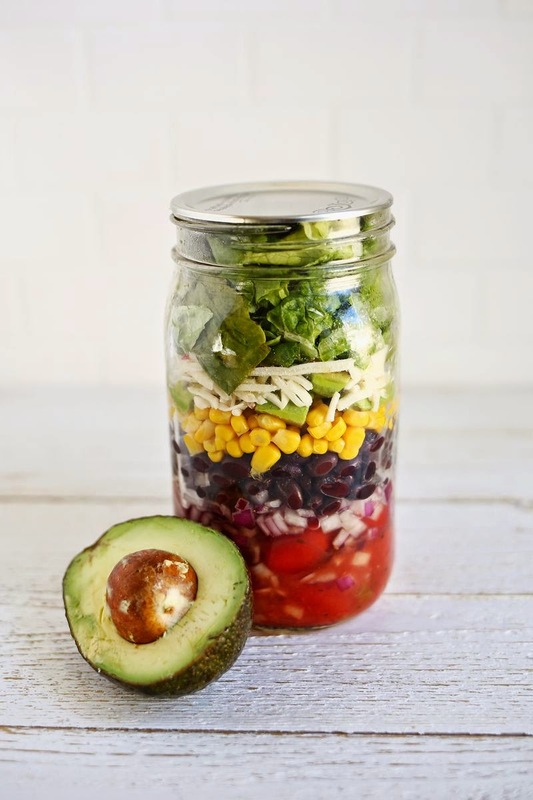 Storing the salad: Screw the lid on the jar and refrigerate for up to 5 days. 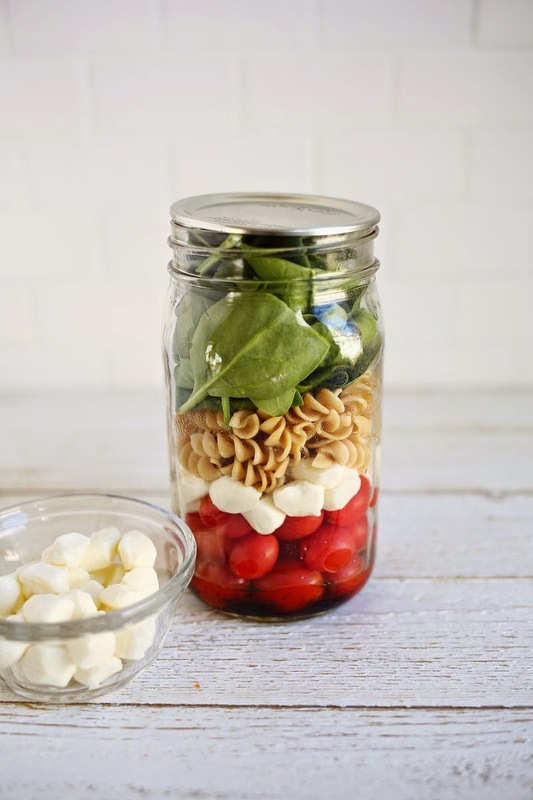 If you're including any cheese, proteins, or soft fruits and vegetables, add these to the top of the jar the morning you plan to eat your salad. Tossing and eating the salad: When ready to eat, unscrew the lid and shake the salad into the bowl. The action of shaking the salad into the bowl is usually enough to mix the salad with the dressing. If not, toss gently with a fork until coated.